When Naruto first summoned Gamabunta, while falling to his death, Gamabunta didn't believe that a little kid like Naruto could summon him. Naruto, angry at the comment, claimed that, as Gamabunta's summoner, he was the toad's master. This made Gamabunta lose his patience with Naruto, and he threatened to kill him. This scared Naruto into submission, but vowed to become the toad's master. It is not until Gamabunta sees the summoning contract scroll that he believes that Naruto actually summoned him, though he is not overly surprised by the fact, indicating that he knew that Naruto was indeed the one who summoned him all along, otherwise the boy wouldn't have persisted to gain his respect. After Naruto passes out from riding Gamabunta trying to make the toad his, the toad boss takes Naruto to the hospital, leaving his footprint as a signature. During the attack on Konoha, Naruto summoned Gamabunta to save himself from being crushed by Gaara's Sand Waterfall Funeral. Gaara was in his full One-Tailed Shukaku form, though Gaara's personality was still dominant at the time. Gamabunta was his usual grumpy self and refused to fight for Naruto. Gamakichi, who had been accidentally summoned by Naruto earlier, told his father that Gaara tried to kill him and that Naruto had saved him. Gamabunta is impressed with Naruto, and he officially accepts Naruto as his subordinate. At first, Gamabunta was able to hold his own, but this quickly changed when Gaara forced sleep upon himself, allowing the Shukaku to take over. This unleashes the Shukaku's full power, which is too much for Gamabunta to handle. However, Naruto and Gamabunta use a Combination Transformation to take on the form of a giant fox (in the anime the fox has nine tails), allowing Gamabunta to get Naruto close enough to Gaara to wake him up by punching him. 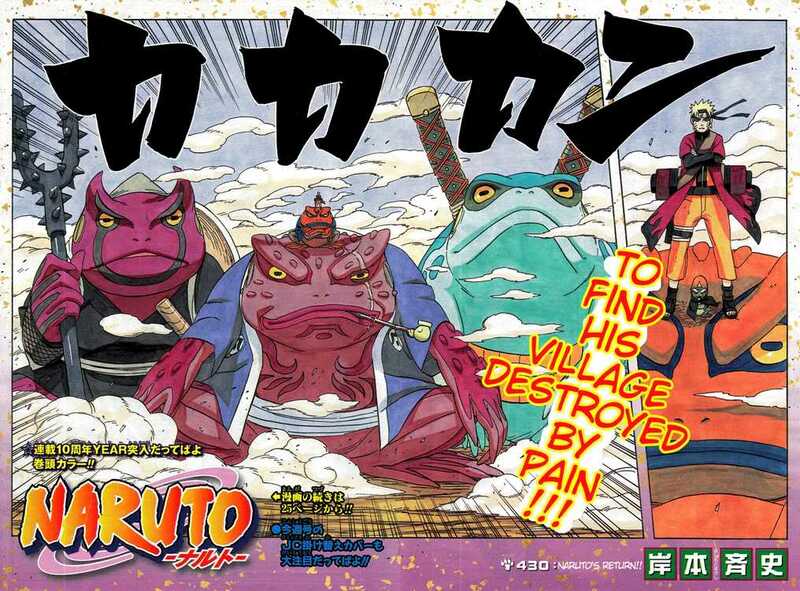 Gamabunta was once again impressed with Naruto and even lamented that he would not be able to see the end of this battle because he had reached his limit and had to return home. During the battle between Jiraiya, Tsunade, and Orochimaru, Gamabunta is summoned along with Katsuyu to counter Manda, Orochimaru's giant snake. He seems to have respect for Katsuyu, as he rescued her from Manda, but there is no love lost between Gamabunta and Manda; after being summoned for the battle, Manda threatens to turn Gamabunta into "toad jerky," and Gamabunta responds to Manda's threat by saying that he has always wanted a "snakeskin wallet." In the Land of the Sea, Naruto summoned Gamabunta to battle against Umibozu, the Sea Boss. Gamabunta wasn't happy about being summoned in seawater (toads are freshwater creatures), but fought anyway because he was underestimated by his opponent. The sea water also gave him a rash. He and Naruto defeated the otherwise indestructible water creature by evaporating it. Gamabunta then threw Naruto into the air as punishment for summoning him in seawater. However he noticed that he was still happy that Naruto took so much care of his children. An advanced form of the Transformation Technique, the Combination Transformation transforms two users into one being. One user usually provides the chakra while the other performs the necessary hand seals. Naruto uses this with Gamabunta in their fight against Gaara's full Shukaku form to assume the appearance of a giant fox (the Nine-Tailed Demon Fox in the anime). Kiba and Akamaru created their own variation of this technique with the Man Beast Combination Transformation: Double-Headed Wolf. The Sound Four used this during the Chunin Exam arc to disguise themselves as the Fourth Kazekage's Bodyguards. Fire Release: Toad Oil Flame Bullet is a two-way collaboration jutsu. Gamabunta will use Toad Oil Bullet to shoot a jet of oil from his mouth. His summoner then ignites the oil. Jiraiya uses Fire Release: Flame Bullet for this purpose, while Naruto, knowing no Fire Release ninjutsu and needing an ignition source, substituted an exploding tag instead. The oil, acting as an accelerant, fuels the fire, creating an conflagration of far greater power and magnitude then the original fire ninjutsu used. The user spits oil from their mouth onto a target. Rather than needing to be near a source of oil, it seems that the user keeps a supply of the oil inside their stomach. When needed, the oil can then be brought up into the user's mouth and shot out under pressure. The jutsu has been combined with several other elements in order to create new techniques, including wind, fire, and both. This jutsu involves Gamabunta using his huge dosu (Yakuza sword) to attack his opponent. The force of the swing is enough to sever one of Gaara's arms when he is fully transformed. Gamabunta gathers a large amount of water in his mouth and then shoots it out multiple spherical projectiles.